A coworker finds a weakened young falcon in the parking lot at work. After a time of rehabilitation at Blandford Nature Center, the falcon returns for release into its natural habitat. 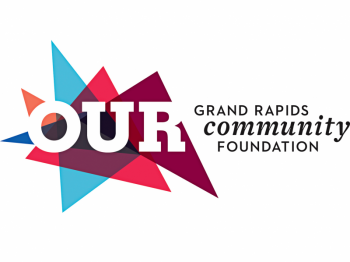 I work in an industrialized section of southwest Grand Rapids that borders residential and businesses alike. Over the years, my coworkers and I have come upon an assortment of domestic and wild animals on the grounds of the business. 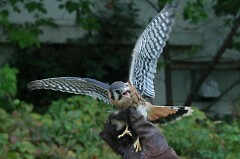 A recent find, in the grassy border of our parking lot, turned out to be a young American Kestrel Falcon. Seeing the bird laying on the ground barely moving, one of my coworkers brought it in to Blandford Nature Center for further assistance. While at Blandford, the young Kestrel was kept in his own small cage and fed 40 grams of food a day. Once he had fattened up, the Animal Care Technicians at Blandford transferred him to a cage containing their two permanent (and adult) falcon residents who helped foster him while he regained his strength. Kestrel babies, much like other birds, are born covered in down. As they age, their adult feathers grow in and replace the downy ones. This Kestrel still had tufts of down feathers on the top of his head, indicating that he was still young, though it was thought he had already been flying and hunting since he was a distance away from any nesting area. Samantha Smith, one of the Animal Care Technicians at Blandford, told us it is likely that the falcon hit a window that left him stunned and unable to fly and hunt. Unable to eat, he had grown weaker and thinner. Once the Kestrel had recovered enough to be released, we received a call from Smith inviting us to witness the event as it was to happen on or around our grounds -- the falcon’s natural habitat. I, along with my coworker who had discovered it (and a couple of others), joined Smith who told us ahead of time to look for a tree that the falcon could fly to once released. We settled on an overgrown empty lot across the street that featured a number of scrubby trees and shrubs. As Smith pulled on a pair of heavy duty gloves and removed the falcon from its cage, she told us that American Kestrels are not only the smallest type of falcon in North America, but also the most common. While all falcons, including Peregrine and Merlin which both reside in Michigan, have a vertical stripe that passes through their eyes, Kestrels are the only ones that have two of these stripes. As the falcon came out of the cage, it flapped its wings excitedly and let out high pitch squawks. We could now see the bold coloring and markings on its plumage, which is an indication that it is a male (females are brown colored, more plain and smaller in size). I pushed the record button on my camera and gave the thumb’s up to Smith who released her hold on the falcon. We watched as it started on a low angle and then flew up quickly. Instead of landing on the branch of a tree, which we had so carefully sought out, the falcon flew even higher, landing on the roof of the neighboring building. It stayed there, watching us as we packed up our gear and headed back. Witnessing a successful release, as this one was, is not an everyday event in my life nor in the lives of my coworkers. I am used to seeing wild animals in cages at zoos or from a very far (and safe) distance. This was a very personal experience as I was only yards away from the falcon and there weren’t any bars separating us. Part of me soared up with the falcon as he took off, leaving me with a natural high for the remainder of the day.